The Ten Six iSUP sports an outrageous price that’s fully justified, and we’ll tell you why! First of all, it’s all in the patented construction of the inflatable 10’6″ long, 32″ wide, and 4.72″ thick board, the MSL Fusion. Red Paddle is known for its “board within a board” construction, but the Ten Six iSUP is the result of industrial fusing and machine pressing the inner layer of polymer to the high density drop-stitch material in the raw stage of manufacturing. What does this mean for you? Ultimate stability, superior performance, and rigidity like no other inflatable SUP can match! 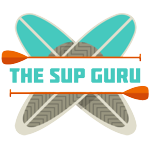 Be it SUP yoga, flat water, or even some medium surfs that you dare to take on, you’ll be able to SUP to your heart’s content without questioning weather conditions ever again. Another focus of the Ten Six iSUP is the bag and the pump that Red Paddle includes in the buy. The Titan pump has double the volume output of other standard pumps which means you get a stiffer board faster and easier than ever before. The Red Paddle bag is an impressive accessory in itself! It can zip on all three sides, has an internal mesh pocket, foil lining, and improved zipper pulls. But, there’s more! Keep on reading! Everyone! Its expert-designed curves make it incredibly easy for the beginner to learn on while still being rugged enough for intermediates and the advanced pros. 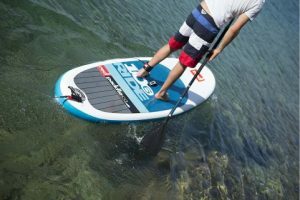 The SUP board and MSL Fusion construction is also spacey and durable enough to take along your four-legged pal! When you want the best paddle board, be it hard or inflatable, all buyers know to turn to the leader in the SUP industry, Red Paddle! Users of the 10’6″ iSUP are convinced with the excellent quality and the high grade accessories. 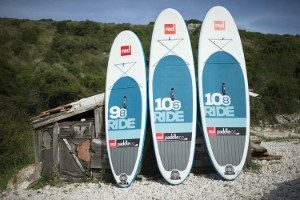 At 20 PSI, super nosy SUPpers are pretty sure it’s a hard board, but we all know it’s not going to hurt if you fall off and get smacked in the face – it’s inflatable! However, it’s going to cost you a pretty penny for the iSUP, and you may be convinced to go the hard board route if you’re spending this kind of money. Also, it seems there was a quality control issue with cracks in the Titan pumps that were issued. But, following up with Red Paddle will land you with a new Titan and maybe some extra freebies! Is the Titan Pump Easy to Use? The ergonomic Titan has been improved to be comfortable to use with its angled foot and wide handle. Many buyers have said it only takes 3-5 minutes to get up to full PSI. What Special Features does the BackPack have? You can easily bungee tie your 3-piece paddle to the bag, there’s an internal cinch wrap to keep the board secure and in place, and tons of space to literally fit all your gear! Guess, what? It’s a rolling bag too! What Kind of Texture does the Ten Six SUP have? The main part of the on-deck anti-slip pad has a crocodile-skin texture which is comfortable and provides ample grip. What is the iFIN System? The iFIN system is Red Paddle’s molded fins that are permanently attached to the board. There’s no need for spares, tools, or replacements. If they get bendy or out of shape during storage, you just need to pour hot water on the fins and reshape them with your hands – simple! What is the RAM Mount? This is the brand name screw thread that’s been integrated on the nose d-ring so that you can mount a GPS, camera, fishing rod, cup holders, and more. It’s compatible with RAM Mount accessories. Unfortunately, this feature isn’t available on the 2016 models and has been instituted on the new 2017 iSUPs. The max weight capacity of the Red Paddle Ten Six iSUP is 220 pounds or 100 kilos. Can you take your Cell Phone on Board? The package does include a waterproof cell phone holder. It’s pretty handy if you want to stay connected while you’re out on the surf. Does the Red Paddle Package come with a Paddle? Unfortunately, the 2016 series of this iSUP doesn’t come with a paddle. 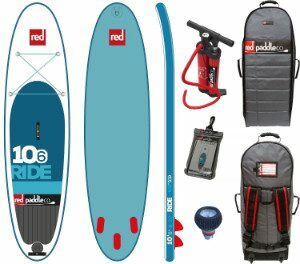 Instead, Red Paddle provides the board, rolling backpack, Titan, pressure gauge, repair kit, and cell phone holder. You do have to purchase a paddle separately. If you love the sound of this iSUP, then you might just be tempted to lean towards the new and improved 2017 Red Paddle Co Ride 10’6 iSUP! It has a few extra perks like the RAM mount, RSS stiffening system, foil-lined rolling backpack, and next EVA tail-end, anti-slip pad! When bare foot, you can feel the diamond-cut EVA texture of the pad without looking down for exact foot placement. But, if the budget can’t stretch quite that much, then you might appreciate the comparable Mistral Adventure iSUP. It’s dimension specs are as close to the Co Ride 10’6″ as is the price. It’s made with military-grade drop-stitch construction that most SUPpers are familiar with and double sidewalls. But, it doesn’t have nearly as cool backpack as Red Paddle’s one! To SUP (sum) it up, Red Paddle has been known to pump out some of the best SUPs in the world, and this iSUP board is right up there with the leading best! Red Paddle says it’s “heralded as a classic in all four corners of the world.” Do you dare to put it to the test? You better get your traveling plans started!